After I returned from Italy I reconnected with an old friend, Eliot Katz, an anti-war activist and poet. We collaborated on a reading of his work with bass accompaniment at an Artists For Humanity concert in April of 2006. We enjoyed it so much we decided to record some more and now invite you to listen to some selections below. Hopefully we can continue to develop this project further. ELIOT KATZ is the author of Unlocking the Exits (Coffee House Press, 1999); Les v oleurs au travail (Thieves at Work) (Paris: Messidor Press, 1992, in French translation) and Space and Other Poems for Love, Laughs, and Social Transformation (Northern Lights, 1990). He is also a coeditor of Poems for the Nation (Seven Stories Press, 2000), a collection of contemporary political poems compiled by the late poet Allen Ginsberg. 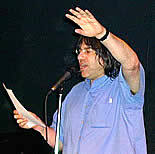 A cofounder and former coeditor of Long Shot literary magazine, Katz's poems are included in the anthologies: Aloud: Voices from the Nuyorican Poets Cafe; Blue Stones and Salt Hay: An Anthology of Contemporary New Jersey Poets; Identity Lessons: Contemporary Writing About Learning to Be American, Bum Rush the Page, Nada Poems, and In Defense of Mumia. He is coeditor of a bilingual anthology published in France in 1995, entitled Changing America: Contemporary U.S. Poems of Protest, 1980-1995. Called “Another classic New Jersey bard” by Allen Ginsberg, Katz worked for many years as a housing advocate for Central New Jersey homeless families. His most recent collections of poetry are View From The Big Woods; Poems from North America’s skull and When The Skyline Crumbles; Poems for the Bush years, both on Cosmological Knot Press. He currently lives in New York City. All Contents Copyright ©2006 Russell Branca. All Rights Reserved.